Jordan Cove field-checking and kayak trip (photo by volunteer Michael Sherman). 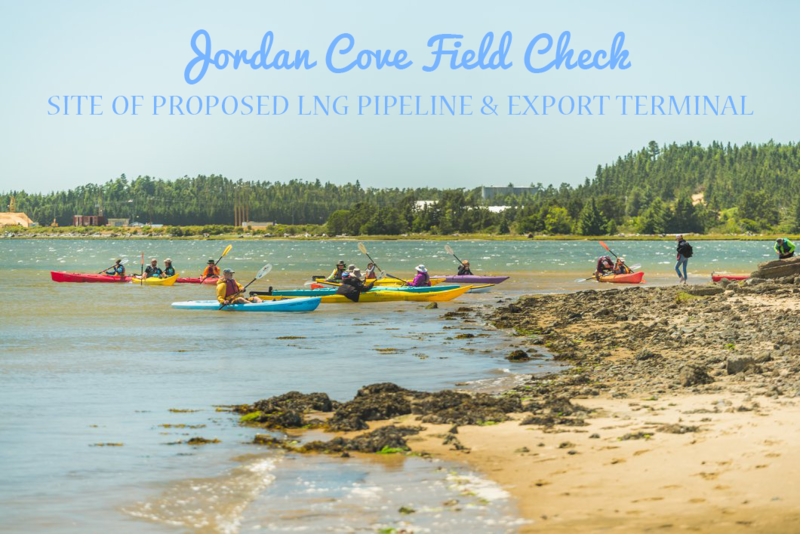 On a spotless, windy morning on July 1, over 50 concerned citizens gathered around a boat launch on the North Spit of Coos Bay to explore the place that would be most impacted by the construction of the proposed Jordan Cove liquefied natural gas export terminal. The event was organized by Cascadia Wildlands in conjunction with the University of Oregon’s Outdoor Program for the purpose of bringing fracked gas resistors from across Oregon to Ground Zero of the pipeline fight. 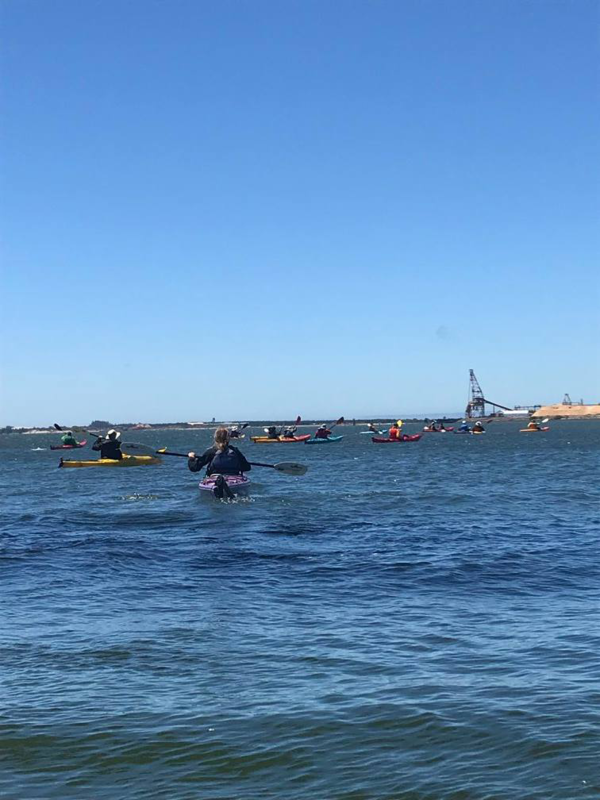 We planned to get a view of the project area from land and water, with outings both on kayaks and on foot in the network of trails around the North Spit. This process of field checking is a tried and true tactic that land defenders use to not only strengthen the relationship between activists and the places we’re working to defend, but also to collect data through observation and citizen science that can be used to submit comments and better resist harmful projects. At the boat ramp that morning, we were joined by residents from Portland, Eugene, Corvallis, Cottage Grove, Coos Bay, and as far south as San Francisco. A typical field-checking trip will bring in anywhere from a handful to a couple dozen people, so this showing of over 50 people highlighted just how many are invested in stopping this project. This is no surprise. 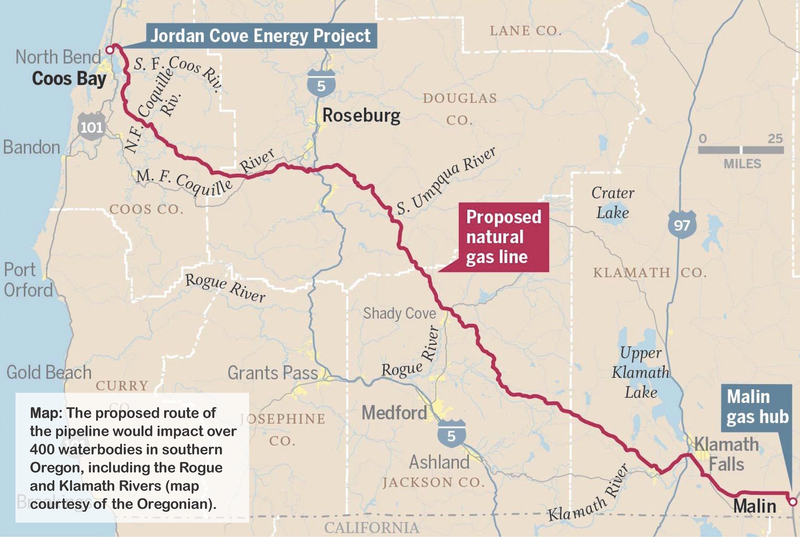 Jordan Cove’s associated 230-mile Pacific Connector Pipeline would bisect southwest Oregon, cross five major rivers and over 400 waterways, clearcut a path through 70 miles of public forest, and impact 28 species protected under the Endangered Species Act. It would threaten traditional tribal territories and sacred burial grounds, and require the government’s use of eminent domain against unwilling landowners. The export terminal itself would be built in a tsunami zone along a well-used and relatively unmarred shoreline. 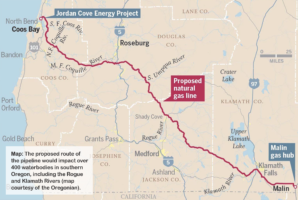 Of course people were interested: this is the largest fossil fuel project proposed in the state of Oregon. In the crowd gathering around the boat ramp were parents, grandparents, students, children, activists, and landowners whose property is directly in the proposed path of the pipeline. Although we knew that there are a lot of folks resisting this project, looking around at everyone who had given up a summer Sunday to field check the area, it was obvious that our community of resistance spans farther than many would guess. Fracked gas resistors got ready for a day of field-checking on land and on sea during group orientation while overlooking the cove (photo courtesy of volunteer Michael Sherman). Before setting off to explore, we gathered for an orientation. We discussed the background of the project, noting that this is the third iteration of the proposal (the reason why we call it the zombie pipeline), and that in the past, the Federal Energy Regulatory Commission (FERC) denied the project because it was not deemed beneficial for the public. We passed out project maps and plans showing where the terminal would be built and what would go into the facility. In pouring over these maps, many people were surprised by just how massive this project would be. Aside from the gargantuan LNG terminal itself, the project includes the construction of administration buildings, housing for workers, an access and utility corridor, and of course, the widening and deepening of the Coos Bay channel to facilitate the large tankers required to transport the super-cooled liquid gas from the terminal to buyers in Asia. Comparing the maps to where we were standing, it was clear that this project would turn a quiet, relatively untouched coastline into a major industrial center. With maps in hand, we set off in groups to explore areas in and around the proposed project. The first brave kayaking group geared up and headed to their launch site at Jordan Point. 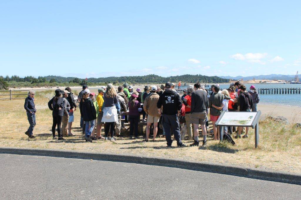 The winds were heavy, gusting up to 20 mph, but the group managed to get around the point and into Jordan Cove, where folks beached and explored on foot the area where the pipeline would enter and connect with the access corridor to get to the terminal. 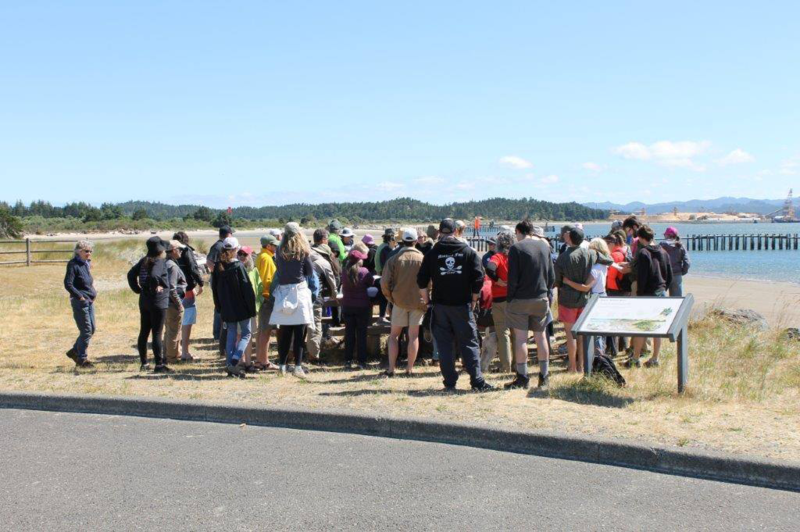 Meanwhile, other groups set off to explore the North Spit trails and the coastline where the LNG terminal itself would be built. In our explorations, we found thriving and intact wetland, native and threatened plants like the silvery phacelia and wolf’s evening primrose, oyster and clam habitat and nesting areas for the threatened snowy plover. We also saw locals fishing, clamming, hiking, swimming and generally enjoying this place that they know as their backyard playground. While the winds were too strong for much kayaking, our group spent a total of five hours trekking the area on foot and set eyes on every place that the terminal construction would touch. We walked the coastline from the boat launch north to the Roseburg laydown site, from Jordan point south through Jordan Cove, and all along the North Spit where dredging would occur along the shore. Each of us field checking came to the table with different skills, experiences, and reasons for resisting this project. At the end of the day, though, we were able to unite around a shared love for the North Spit of Coos Bay and an understanding that this terminal cannot be built. The trip ended with a debrief at a local brewery. Locals and landowners joined us there; standing on chairs to address the group, and share their stories and reasons for not wanting to see the pipeline go through (photo courtesy of volunteer Michael Sherman). When we were done field checking for the day, our group reconvened at the local brewery for some refreshing drinks and a debrief. 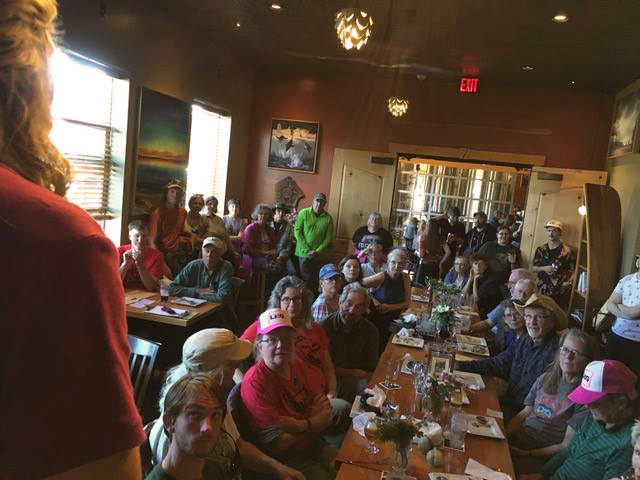 At the brewery, we completely filled the space with fracked gas resistors (photo at right) where locals and landowners stood on chairs to address the group, and share their stories and reasons for not wanting to see the pipeline go through. Listening to them speak, many of us couldn’t help but get teary eyed and angry at this obviously irresponsible and destructive proposal. At the same time, being in that space together emboldened us for the work that’s yet to come. While most field-checking trips that Cascadia Wildlands leads connect people with threatened places, this trip went a step further by connecting people with people. 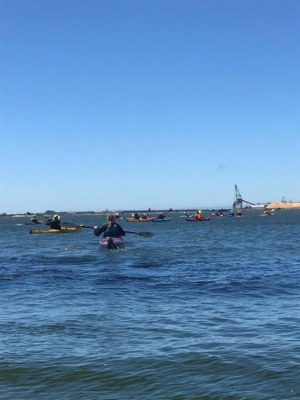 The experience of being on the North Spit with fracked gas resistors from all over Oregon demonstrated the strength, mutually supportive, and strong nature of our community. Despite the fact that this fossil fuel project is daunting and the forces behind it powerful, standing together on the shores of Coos Bay, we realized that our power is greater. We plan to win this fight against destructive fossil fuels with arms linked and standing together. Will you join us? Check out our WildCAT volunteer team here for more information on how to get involved with Cascadia’s grassroots resistance to this project. Currently, public comment periods for the Army Corp of Engineers and Oregon’s Department of Environmental Quality water quality permits are open! Contribute your voice to the chorus in opposition to this project. To tell the Army Corps of Engineers to reject the Jordan Cove Project, click here. To send a comment to the Department of Environmental Quality, click here. Download a one-page Jordan Cove fact sheet. Download the fact sheet Climate Impacts of Natural Gas and Exporting. To tell Oregon’s Governor what you think, click here. Write to the federal government or your local governments. Talking points here.